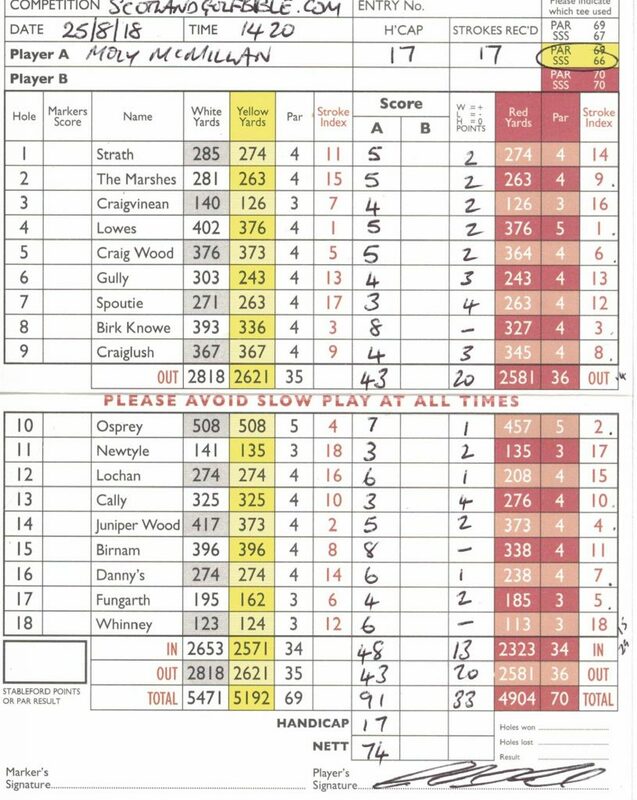 Posted in 18 holes, 1946 - 1999, 3 star, 3 star, Aberdeen City and Shire, Course Architech, Course Owned By, Course Quality, Course Type, Donald Steel, Holes, Members, Overall Value, Parkland, Price, Region, When Course Established, £40 - £59	| Comments Off on 85. Portlethen. 2 Sep 2018. Winston Churchill one said “this is a long speech because I’ve not had time to prepare a short one”. That feels like my dilemma in writing about the wonderfully crafted golf course at Lundin Links; what to leave out? 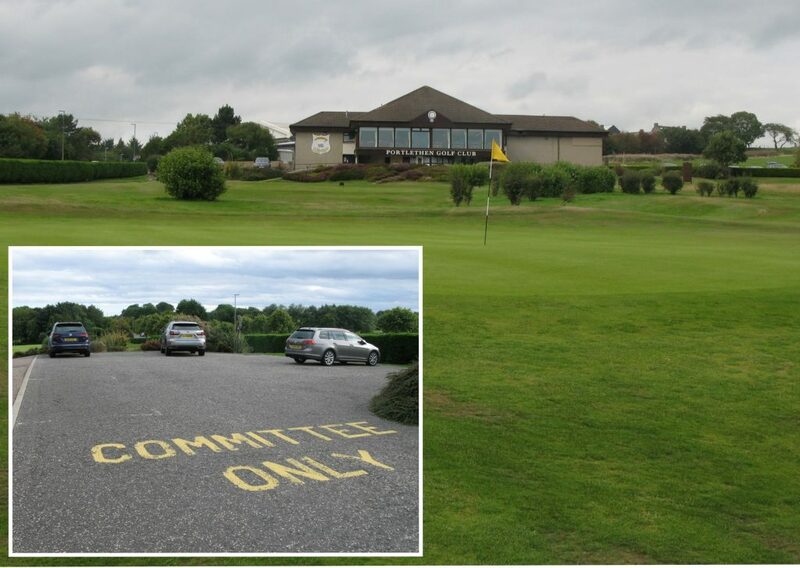 I say the golf course “at” Lundin Links, because that is actually the name of the town, which sits on the southerly Fife coast about 12 miles south of St Andrews, where the Lundin Golf Club is based. I think it’s the only place in the world where the town has the more appropriate golfing name than its golf course! 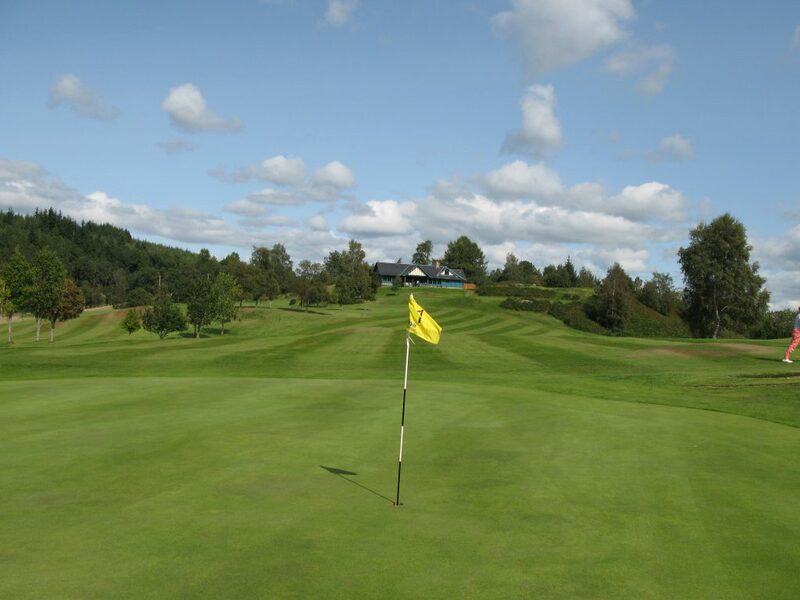 Moly at Lundin’s par 3 14th – where you can see all the 18 greens! This naming conundrum is aesthetically appropriate because Lundin golf course poses a few other riddles. Along with the adjacent Leven Links (the name of the golf course by the way, not the town, which is simply called Leven; au contraire!) it had the first ever 18 hole golf course with 18 separate greens, established in 1868. 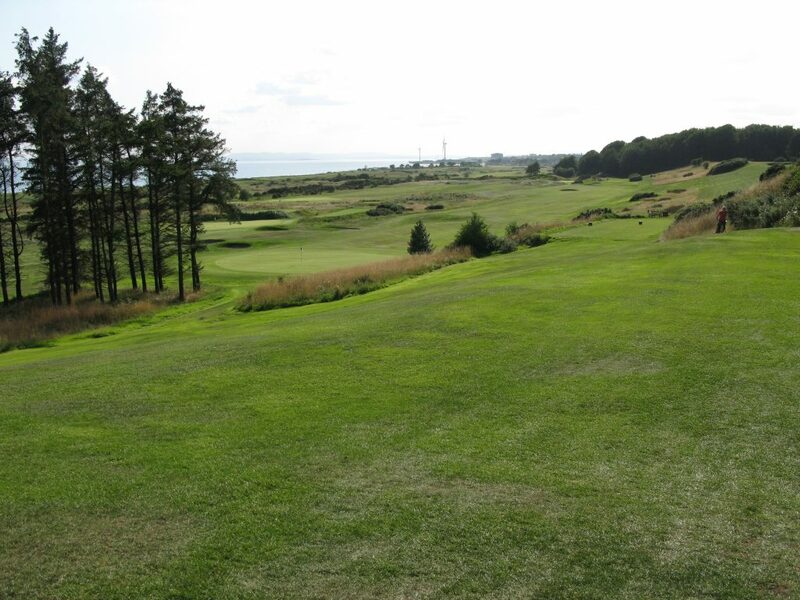 That original 18 hole layout, 9 holes of the current Leven Links course plus 9 from Lundin, separated by the Mile Dyke, is still played, but only once per year in a competition to mark its history. 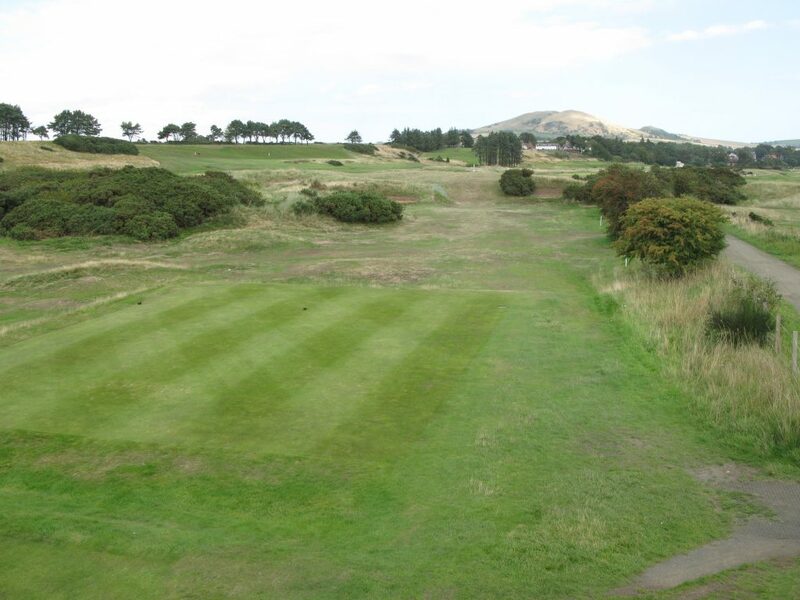 I covered the history of the split in the courses fully in the Leven Links blog here. View across the Lundin course from the 13th fairway. The real riddle at Lundin was the architectural one given to James Braid, who was tasked in 1908 with adding 9 holes on the inland side of the 9 holes crafted by Old Tom Morris, to leave us with the current 18 hole layout. The resulting course is an absolute beauty, and I’m sure Braid tinkered with the bunkering of Old Tom’s holes as well. Old Tom’s holes are now the first 5 and last 4. The course is a nice length at about 6400 yards; not long by today’s standards, but with some fascinating decision making, especially from the tee. Until very recently it was used for final qualifying when the Open was staged at St Andrews, a measure of its quality and condition. 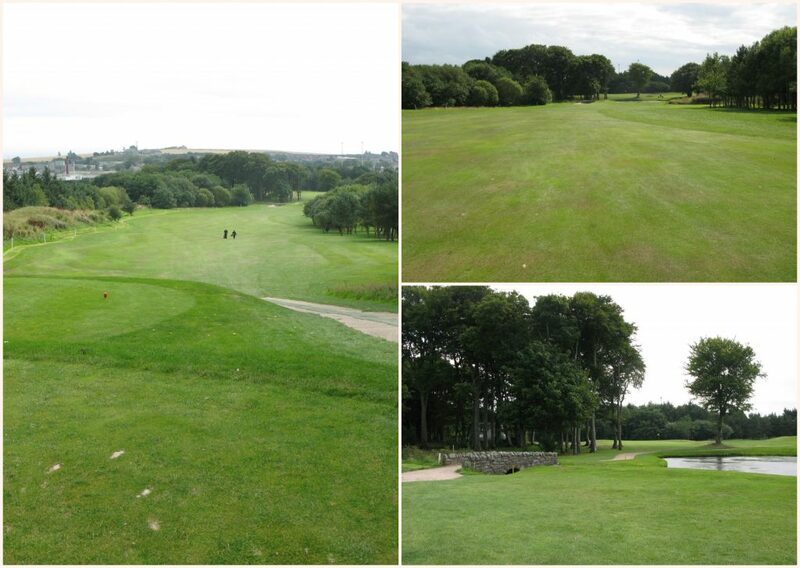 The course was in excellent condition when I played, as a guest of local member Eric Brown and his wife, Moira. I ungraciously won the “6 point per hole” match play game, although it was nip and tuck most of the way round. 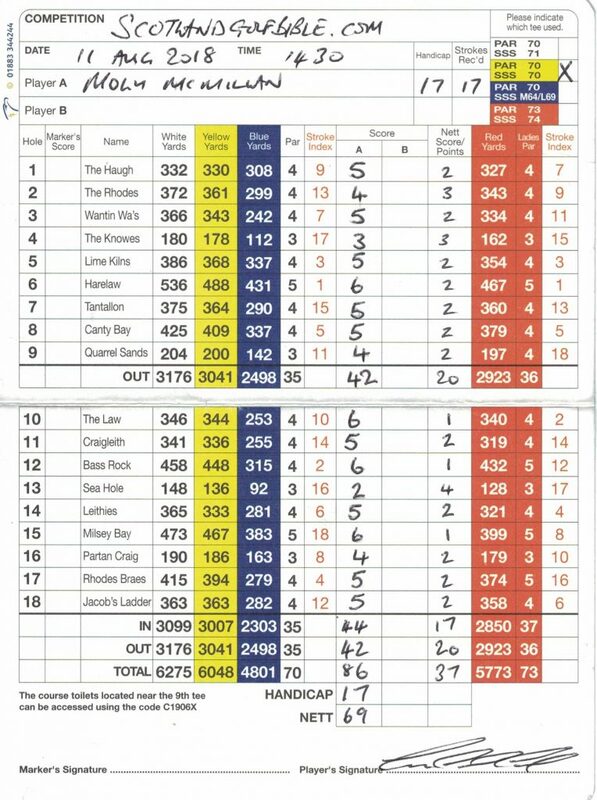 My 9 pars off my 16.8 handicap did rightly elicit a self induced “bandit” conversation, albeit my 3 lost balls (1 resulting in an 8 at the par 4 18th), meant that my 36 points on a fine day would likely have been only in the handicap buffer zone! That’s my defence anyway M’Laud! Enough about me, the golf course is the star here. It’s also a good time to introduce readers to Golf Club Atlas a non commercial web site run by and for golf course architects, where you can find some excellent reviews of many of the worlds great courses. Being reviewed by Golf Club Atlas is a measure of a course’s pedigree, as well as giving great insight as with their entry for Lundin. 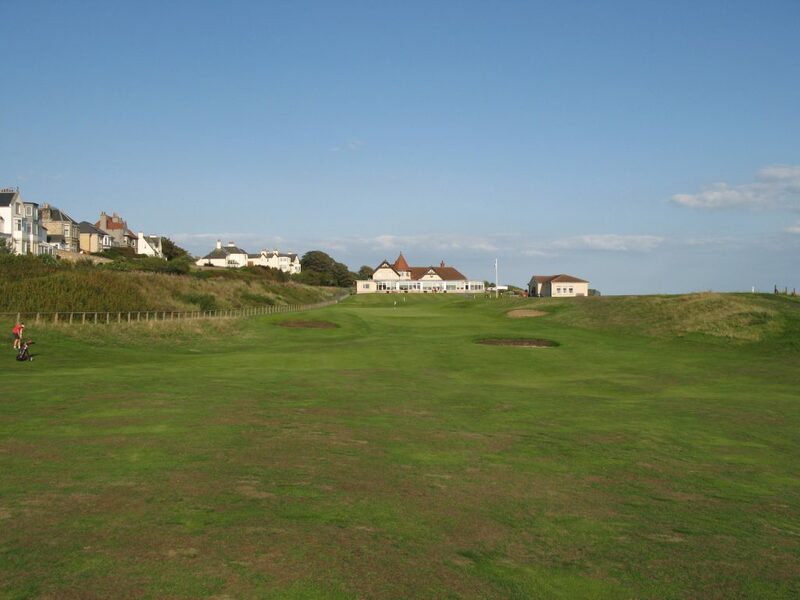 The first 4 holes are classic links holes, played normally into the prevailing wind, with OOB along the left with the beach awaiting a wild hook. The first is a difficult 400+ yards par 4, with a mid to long iron needed to an uphill plateaued green; the second, a shorter par 4, requires good judgement to stop short of a fairway burn with your tee shot; then the 3rd, another short par 4, presents a challenging drive to miss several fairway bunkers. The 4th, however, is where many a round will come unstuck. Any time a James Braid influenced course has a stroke index 1 hole without any fairway bunkers, one needs to probable play it as a par 5. I failed to adhere to this plan, and ended up hitting a decent second shot with a hybrid to the right on the green and never saw it again – whether it cleared the deep burn I will never know! 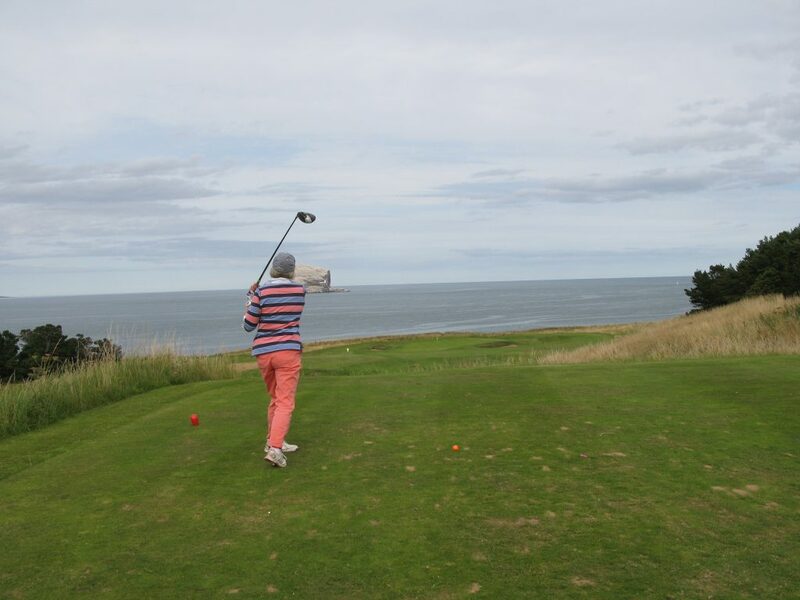 Eric Brown playing at the par 3 5th hole, one of only 2 holes at Lundin not playing in the coastline direction. After a relatively short par 3 5th, you leave Old Tom’s legacy and move to the other side of an old railway line that slices the course in half, and play the 9 Braid holes, the first 3 of which have the railway as OOBs to the right. By the time you have played the 6th and 7th, you might also have picked up another clever feature of this course – the short par 4s tend to have very tricky greens. The view from the 6th tee, one of the short par 4s with a very tricky green. The 10th hole was another of the typical strategic challenges; the fairway is cut in two between the tee and green; go left where no bunkers exist, but leave a blind second with the green side bunkering obscured, or go right for an easier approach shot, as long as you miss the well placed fairway bunkers. A joy of a hole. After playing the, arguably parkland, inland holes of 11 through 13, you reach a place arguably unique in world golf. 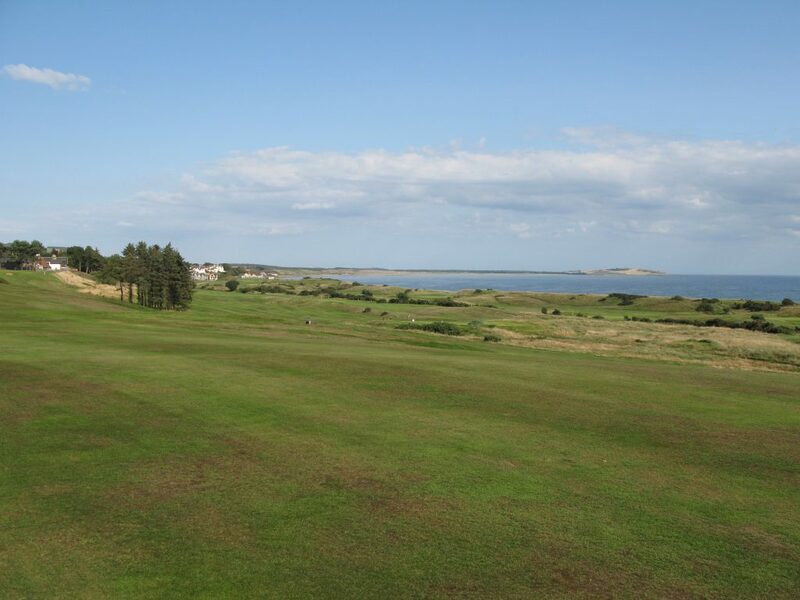 From the 14th tee, you can see every green on the course, along with a magnificent view of the Firth of Forth and the North Berwick coast in the distance. This view is worth the green fee alone. The 14th is also a great par 3, with a significant drop, so club selection is key to this hole – it’s better being long than short here by the way. After a nice set of par 4s, you come to the very difficult last hole, a long par 4 played to a long and slightly raised green that slopes from back to front in front of the terrific clubhouse. I think the number of visiting golfers that find this green in regulation will be low; plus the sting in the tail is that it has a very difficult green to finish. I ended up with an 8, having put my second OOB to the left. The difficult long par 4 18th hole, in front of the lovely Lundin clubhouse. Moira, seen here playing her approach, having just stayed in bounds on the left. People say that Lundin is a “gem”, but I disagree. Its much better than that; for me, the term “gem” has evolved into one used to describe “great courses, but somewhat unknown or off the beaten track”. Lundin is very much on the well trodden track, is a merge of architectural significance by 2 of the greats, and it is a joy, for many reasons. A must play Scottish golf course. Buy the Course Guide, and study the holes! 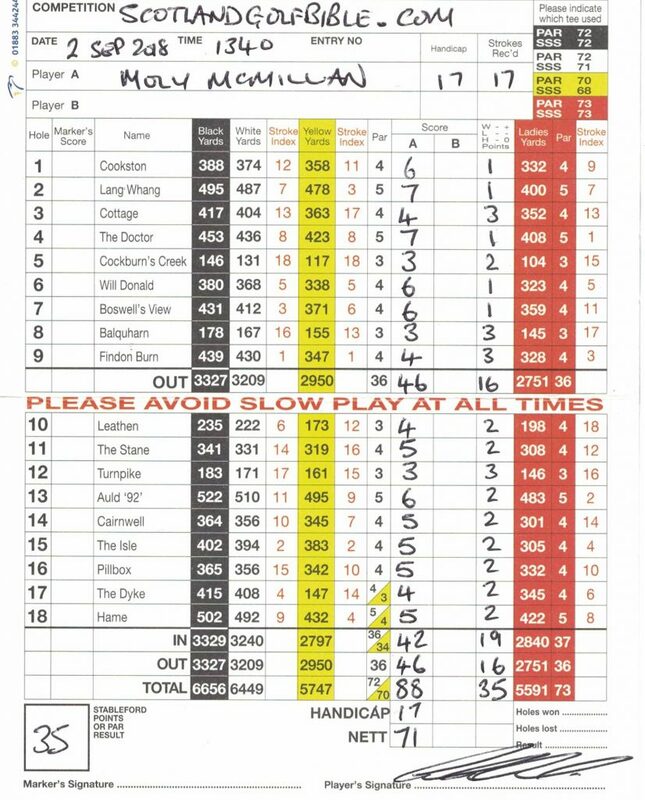 Moly’s very mixed Lundin scorecard – 9 pars, but still 21 over par for 91! 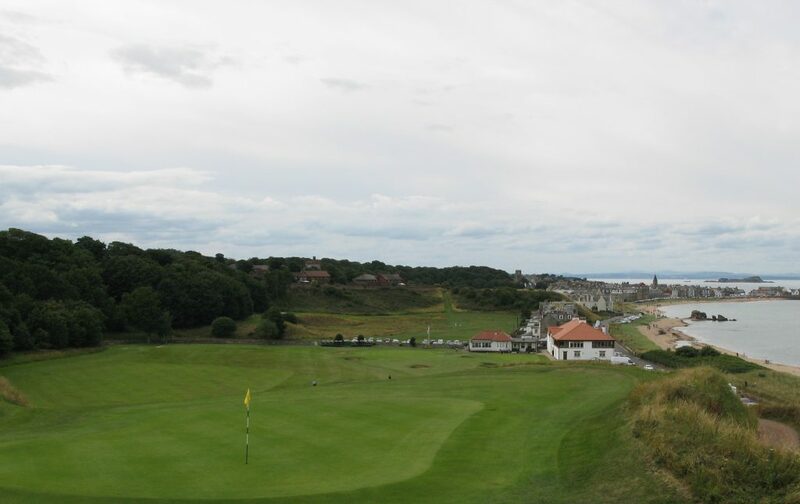 Posted in 18 holes, 1851 - 1900, 4 star, 5 star, Course Architech, Course Owned By, Course Quality, Course Type, Holes, James Braid, Links, Members, Old Tom Morris, Overall Value, Price, Region, The Kingdom of Fife, When Course Established, £60 - £79	| Comments Off on 84. Lundin. 31 Aug 2018. 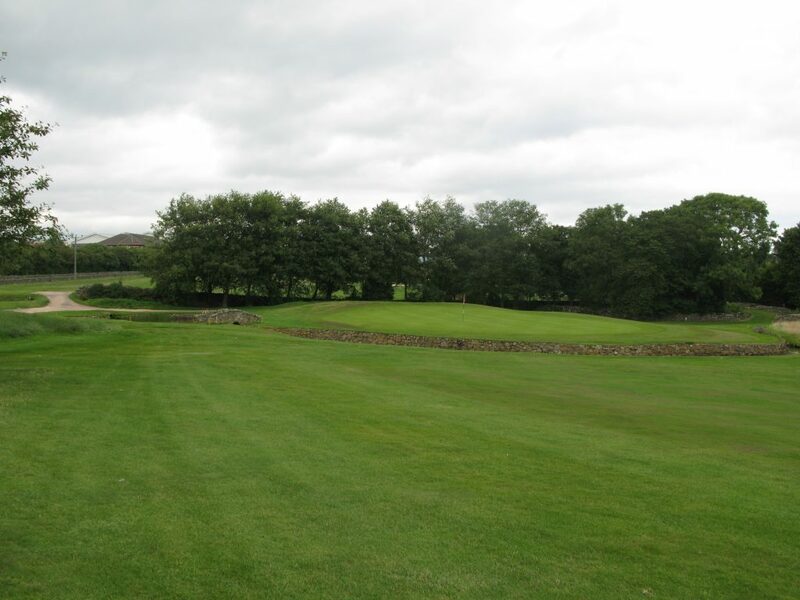 This brilliantly located course, with great countryside views, is a tough 18 hole undulating walk – I wonder whether in time the club may reflect it should have stayed as a 9 hole layout? Dunkeld and Birnam Golf Course is just a few miles east of Dunkeld, in the village of Birnam, in what the club describe on their website as “Highland Perthshire”. Birman and Dunkeld were actually different villages set on opposite banks of the river Tay, until they were connected in 1809 by a Thomas Telford bridge. It is in an area of outstanding beauty, and I suspect many visitors may decide to play golf whilst on holiday. Moly at the par 3 11th, one of the new holes created in 2000. 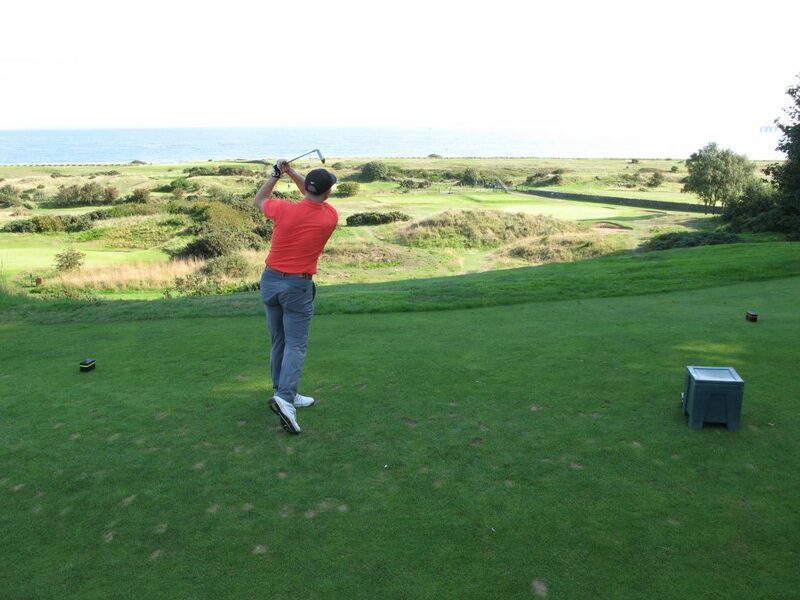 The course was designed by Old Tom Morris in 1892, and was only extended to 18 holes in 2000. The new holes are very much more open parkland, and slightly out of sorts with many of the original holes, which provide some typical “highland” holes. The new layout also caused a change in the hole order, with the 17th and 18th (both originally part of the 9 hole course) being 2 of the 4 par 3s of the 18 hole course. This makes for a rather unbalanced course in my view. 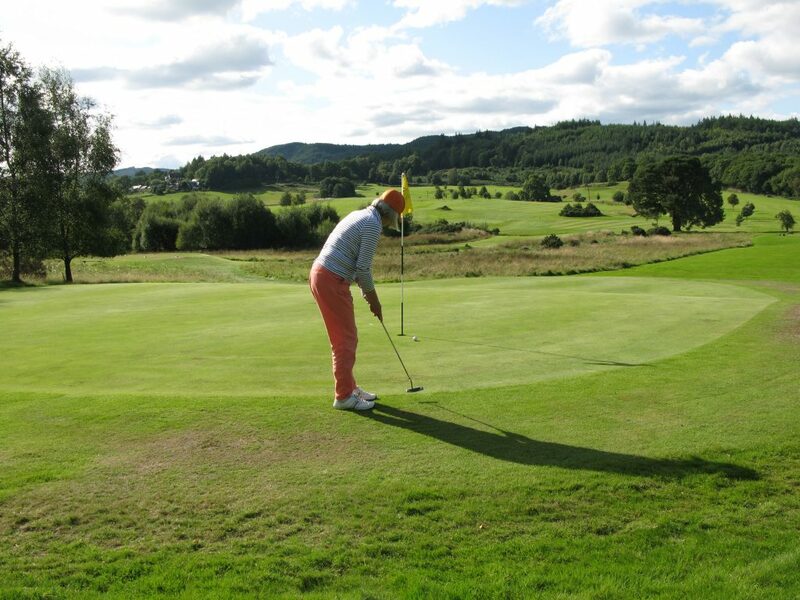 With the increasing debate about 9 hole golf competitions, as a means of encouraging play, I wonder whether Dunkeld and Birnam should have remained a 9 hole course? I certainly think there is a charm in the “highland 9 holer”, which arguably has been lost. The risk reward par 4 6th hole, with the picturesque surrounds. The course is relatively short, but it feels much longer, due to the many undulating holes, and there are a couple of fairly long walks between green and tee (the 7th to 8th being the longest, between the old and new holes). The walk up to the 18th green warrants a buggy hire in its own right and, thankfully, there are several available for hire. Having said all this, which might be unfairly critical, it’s really well worth the visit to play Dunkeld and Birnam. The overall condition of the course was excellent and the greens were lovely. 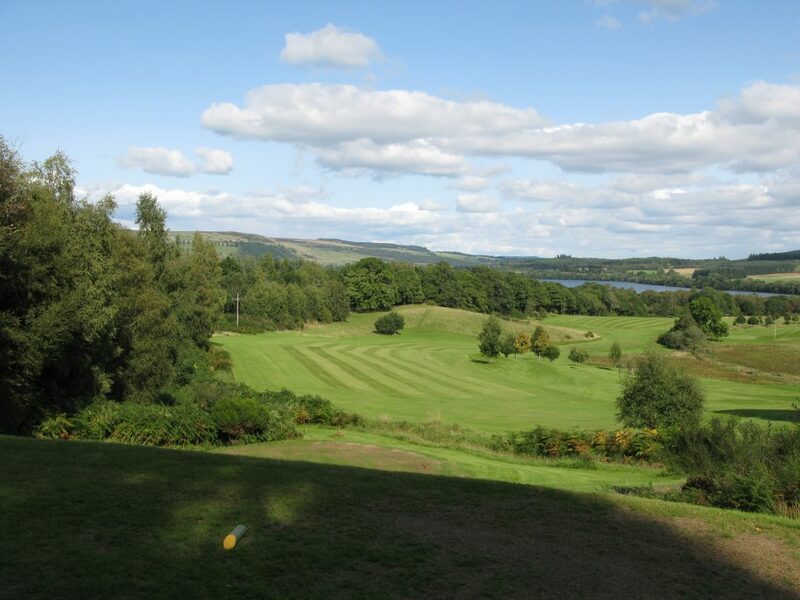 The views were outstanding, including overlooking Dunkeld and taking in The Loch of the Lowes, and I think that playing in early Autumn must be particularly spectacular, due to the many trees surrounding the local hillsides. It is an area renowned for local bird life. The 9th tee, with The Loch of the Lowes in the distance. Even if not playing golf here, the Golf Club has a really nice clubhouse, with beautiful countryside views and would be nice to visit for the good food also on offer. The members were very friendly to Fran and I, and they were very proud of their club. They are also an enterprising club and have an apartment for rent in the clubhouse. The course has some very interesting holes, and also several short par 4s which present the classic risk and reward dilemma, no more so than the 6th, one of several drive-able holes; on the day I stuck to a conservative strategy, albeit my scoring (91 for 33 points), may indicate I should have played driver more often! The best hole for me was the SI3 7th hole, where a mid iron is likely needed to a raised green surrounded by trouble. I suggest you play more club than you think towards the left side of the green. 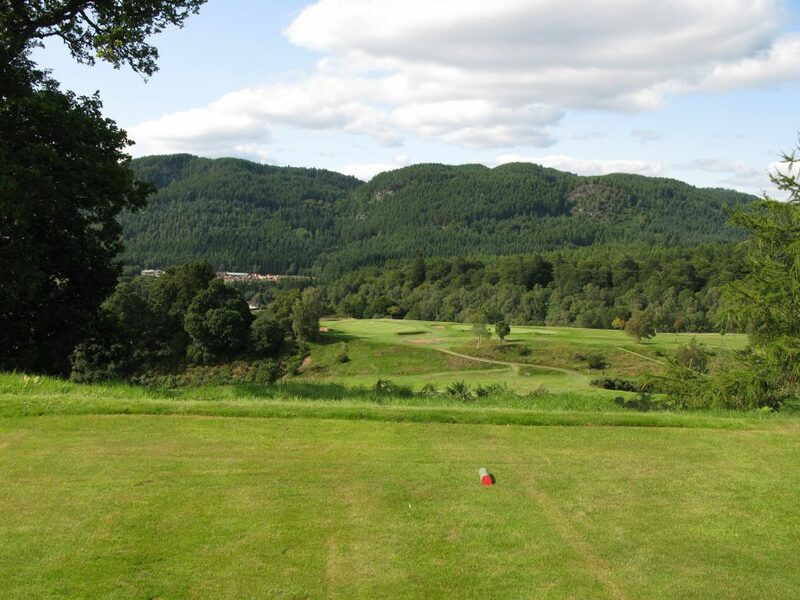 Worth playing Dunkeld and Birnam, not least for the friendly welcome and the outstanding views from the clubhouse, over the tipple of your choice. 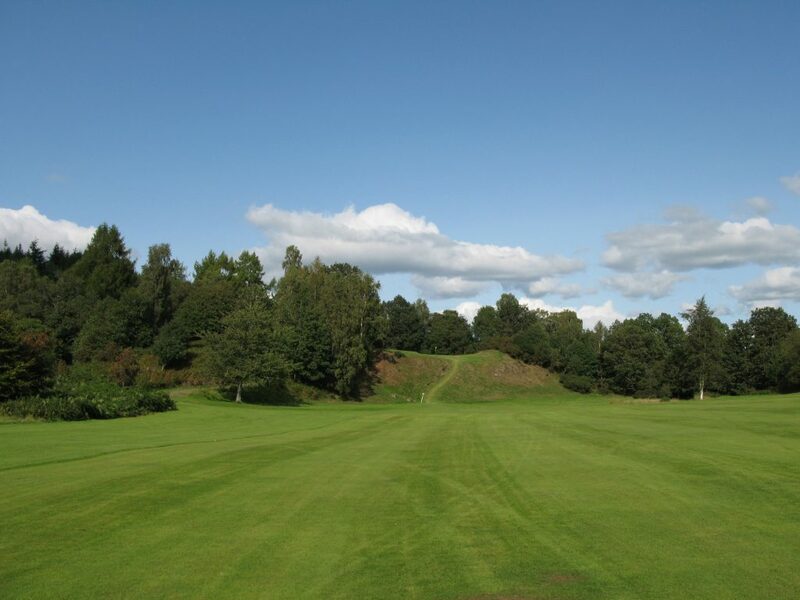 Posted in 18 holes, 1851 - 1900, 3.5 star, 4 star, Course Architech, Course Owned By, Course Quality, Course Type, Heathland, Holes, Members, Old Tom Morris, Overall Value, Perthshire, Price, Region, When Course Established, £20 - £39	| Comments Off on 83. Dunkeld & Birnam. 25 Aug 2018. Excellent vistas, with some memorable holes, but clearly an overplayed course and a little worse for wear. 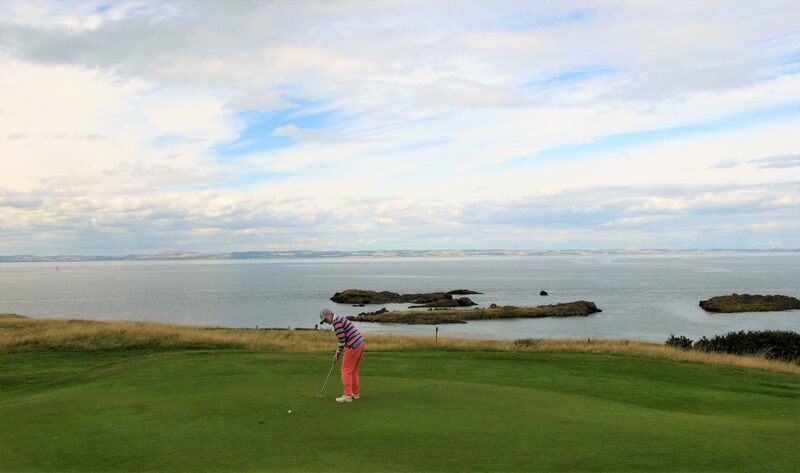 The seaside town of North Berwick, about 25 miles east of Edinburgh, sits along an outstanding coastline that is home to many renowned and world class golf courses, helpfully listed in the East Lothian golf website here. The Glen golf course sits on the east of the town, and has historically been called “East Links”, to differentiate it from its more westerly and much older “West Links” neighbour, North Berwick golf course, which is one of Scotland’s great championship golf courses. The Bass Rock from the 10th tee at The Glen. The North Berwick “West Links” golf club actually opened in 1832. Demand for golf expanded rapidly towards the latter part of the 19th Century along with the expansion of the railways and the increased wealth and leisure time which came from the Industrialised age. 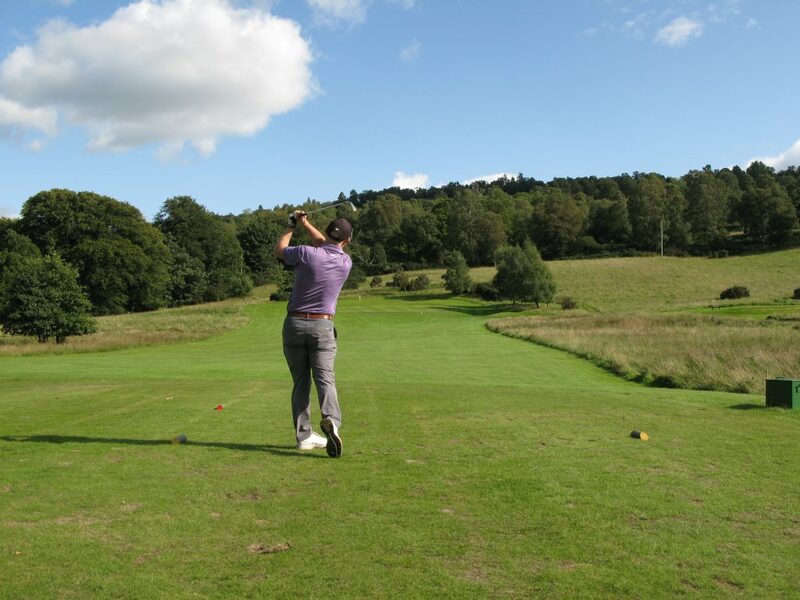 A second 9 hole golf course to meet this demand was laid out in the east of the town in 1894, designed by Ben Sayers, the legendary Scottish golf professional and club innovator, who played a match to mark its opening. Then, only a little over 10 years later, Sayers again, this time in conjunctions with James Braid, oversaw the extension to 18 holes, of what is now The Glen golf course. The view from the 1st green at The Glen towards the nice clubhouse. 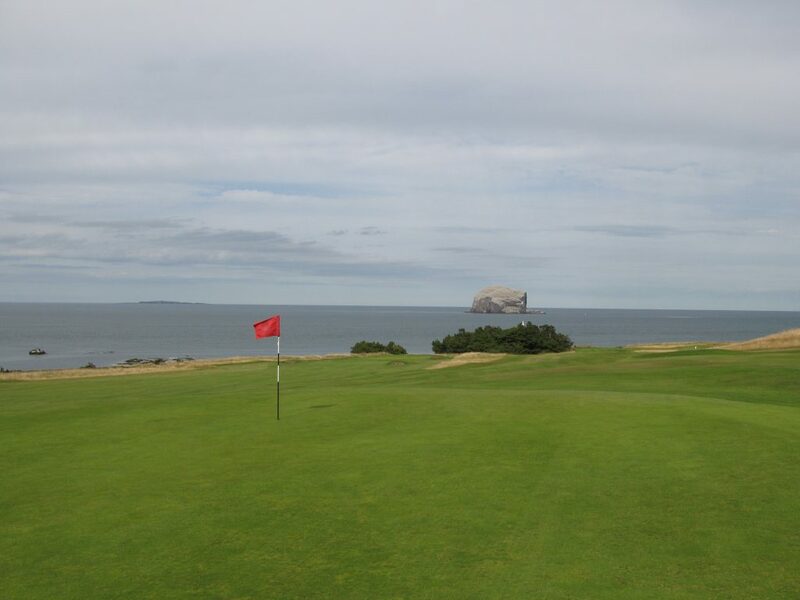 The course is dominated by the views of the Bass Rock, one of the several islands which dot the outer part of the Firth of Forth. The rock can appear almost fluorescent in the correct light, which is the result of the white droppings of the large colony of gannets which inhabit it. Views North towards the Fife Coast from the mid iron par 3 4th hole, where Fran and I both kept right as guided in the Course planner! 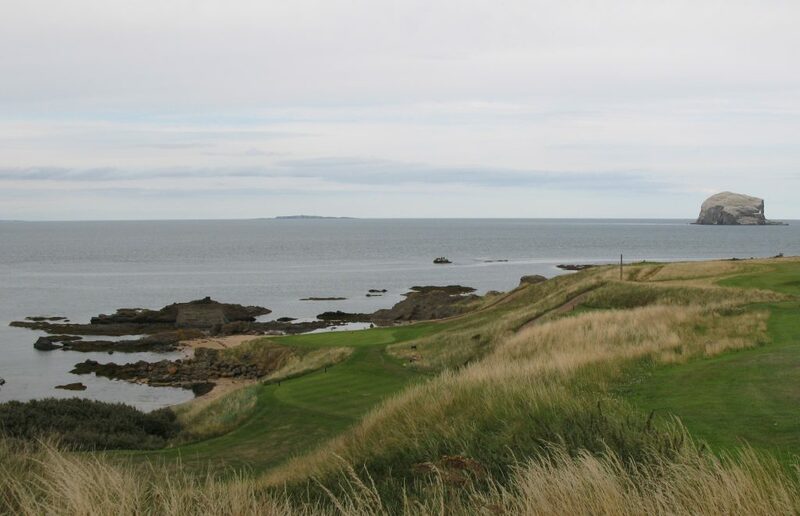 In fact, the coastal views from the course are among the best in Scotland, extending far north to the Kingdom of Fife; however, they serve as a rather flattering deception as many of the holes of the course are in my opinion pretty bland. In particular, the several holes on the inland most side of the course are built on arable turf and don’t feel particularly links like at all. Fran at the 9th, with a view of the typically worn teeing ground. The course is basically an out and back layout, and starts with one of the most challenging holes, which after a fairly innocuous drive to around 200 yards, requires an uphill shot to a blind green – take at least 2 clubs more than normal, as the green is very long. 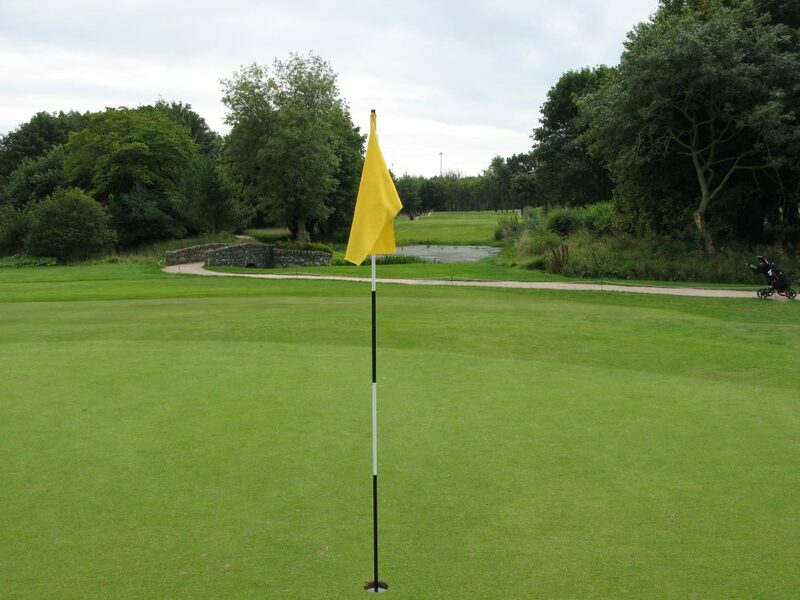 If you just get to the top of the hill, you’re faced with almost an inevitable 3 putt!. This brings me to the greens – they were in good condition but seemed to have a great deal of variability of pace, which I never got used to and I three putted 8 times, which I think must be my record. The course was otherwise in fair condition, except for the tees which were really very poor, and a clear sign of the amount of play throughout the summer – granted, the dry summer may not have helped the green keepers. 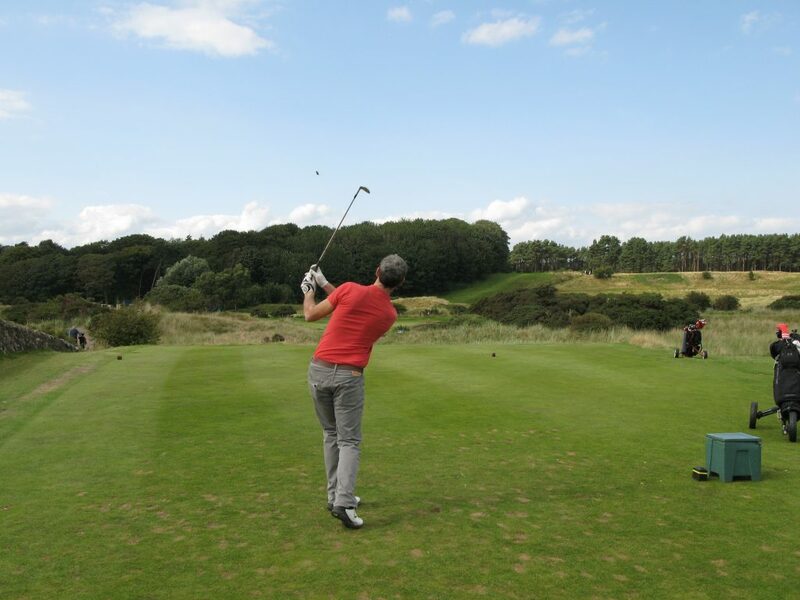 Nevertheless, the high amount of golf played is a really good thing, as golf in Scotland is in general decline. I think The Glen provide a nice welcome and the facilities and clubhouse are new and very good, another sign of the general wealth on the coastline. The signature par 3 13th green here seen from a distance. Note the hole is not played in this direction. The course does have some excellent holes, and some very challenging ones, in its 6000+ yards locker. The best known is its signature hole, the 13th, which has been likened to the famous short 7th at Pebble Beach in California, which if you look at comparable pictures is not unreasonable. Other than my putting I had an excellent day, scoring 86, having hit 10 greens in regulation; this was greatly helped by the pretty wide fairways the course has. The nicest thing was having a birdie 2 at the signature hole. It’s worth playing The Glen, but if possible I would think that early season would be a time the course is at its best before the Summer visitor season. 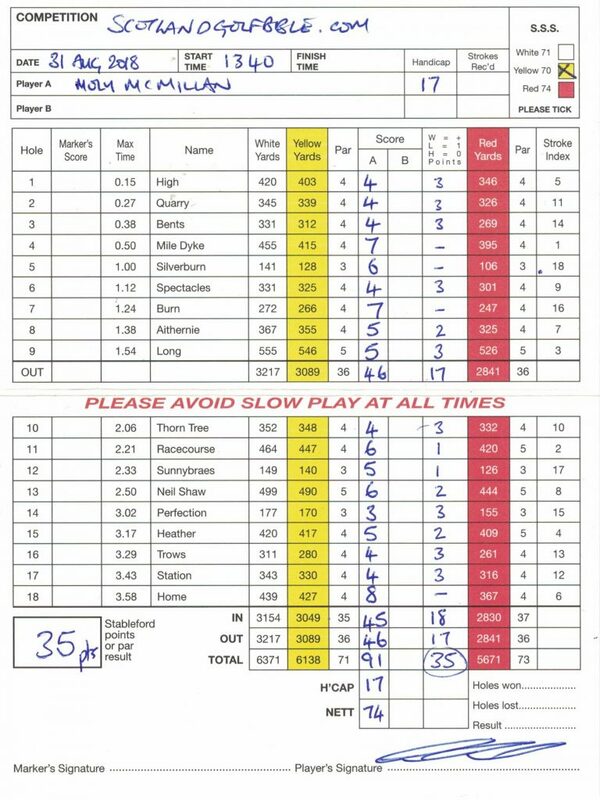 Some excellent play for 86 at The Glen; but included 3 putting 8 greens! Posted in 18 holes, 1901 - 1945, 3 star, 3 star, Ben Sayers, Course Architech, Course Owned By, Course Quality, Course Type, Edinburgh & The Lothians, Holes, James Braid, Links, Members, Overall Value, Price, Region, When Course Established, £40 - £59	| Comments Off on 82. The Glen, East Links, North Berwick. 11 Aug 2018.